Introducing the revolutionary original multi-purpose Sunshade Guardian Mask to Australia! The Ultimate horse mask has a unique patented design and offers 95% UV protection, unlike normal flymasks. This remarkable product is known to help horses with conditions such as uveitis, glaucoma, eye cancer, cataracts, headshaking, eye injuries or irritations! However, it is suitable for ALL horses providing superior eye protection all year round from the harmful ultra violet rays as well as providing protection against insects, wind blow particles, sharp objects and injury from rubbing. Guardian Masks come in a range of sizes and styles including the paddock mask and lightweight "Ride 'In'" masks. They can also be fitted with a nose cover on request made from the same material as the fly mask. The Original Multi-Purpose Guardian Horsemask with 95% UV shades. Recommended for horses with any of the five major eye conditions: Uveitis, Headshaking, Cataracts, Eye Cancer and Glaucoma. 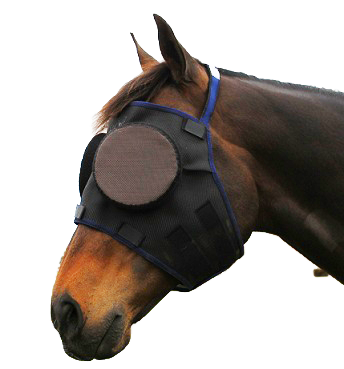 Also for horses with injuries to the eye or eyelid which needs additional protection. Also aids in general protection and protection against insects. The Lightweight Riding and Racing Guardian Mask with 95% UV Shades. Especially designed with the working horse in mind. Protects while performing in the arena, on the race track, sporting events, endurance rides, jumping and much more. The slimline Riding Guardian Mask offers the same unique protection as the original Guardian Horsemask without the additional straps that attach under the horses jaw. Every Guardian Horsemask is handcrafted using only the highest quality materials and workmanship to ensure strength and durability. This mask is designed to last. The 100% woven nylon fiber mesh incorporates a unique interlocking design that will not unravel. The Guardian Horsemask is sewn with nylon thread for strength and trimmed with super strong woven polyester braid. Superior Quality designed to meet equine needs.